English man of letters; born in London Feb. 14, 1864. When he was young his parents moved to Bristol, where he attended the Red Cross School; and after their return to London he entered the Jews' Free School, later becoming a teacher there and taking the degree of B.A. at London University. A misunderstanding with the directors of the school caused him to resignhis position, and he then devoted himself to literature. He had already shown considerable taste in this direction, having edited and partly written as early as 1880 an annual called "Purim"; and shortly after leaving the Free School he published, under the pseudonym "J. Freeman Bell," an elaborate novel written in collaboration with Lewis Cowen and entitled "The Premier and the Painter" (1888), a work somewhat in the style of Lord Beaconsfield, but with passages of Dickensian humor and with an entirely original plot. He had been appointed editor of "Ariel," and for a time was associated with a number of young literati like Jerome K. Jerome and Robert Barr, who represented what was known as the "new humor." This phase of his work was represented by his "Bachelors' Club," issued in 1891, and by "The Old Maids' Club," produced in the following year, each of these books being a series of fantastic sketches replete with the wit and humor of topsyturvydom. 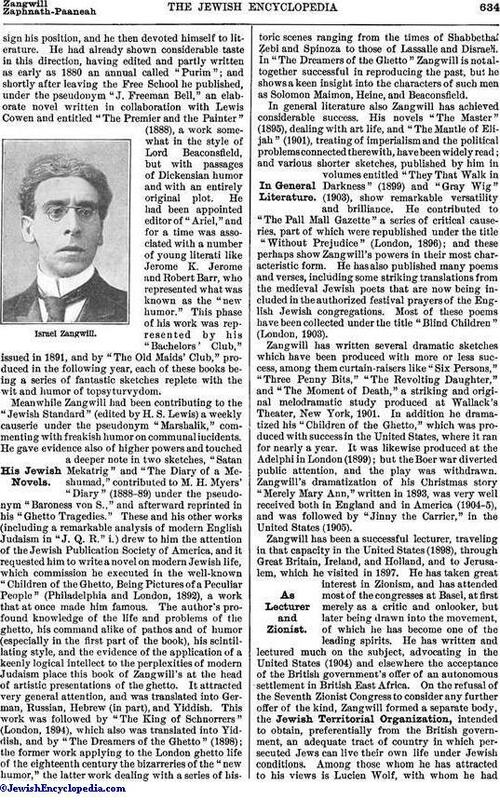 Meanwhile Zangwill had been contributing to the "Jewish Standard" (edited by H. S. Lewis) a weekly causerie under the pseudonym "Marshalik," commenting with freakish humor on communal incidents. He gave evidence also of higher powers and touched a deeper note in two sketches, "Satan Mekatrig" and "The Diary of a Meshumad," contributed to M. H. Myers' "Diary" (1888-89) under the pseudonym "Baroness von S.," and afterward reprinted in his "Ghetto Tragedies." These and his other works (including a remarkable analysis of modern English Judaism in "J. Q. R." i.) drew to him the attention of the Jewish Publication Society of America, and it requested him to write a novel on modern Jewish life, which commission he executed in the well-known "Children of the Ghetto, Being Pictures of a Peculiar People" (Philadelphia and London, 1892), a work that at once made him famous. The author's profound knowledge of the life and problems of the ghetto, his command alike of pathos and of humor (especially in the first part of the book), his scintillating style, and the evidence of the application of a keenly logical intellect to the perplexities of modern Judaism place this book of Zangwill's at the head of artistic presentations of the ghetto. It attracted very general attention, and was translated into German, Russian, Hebrew (in part), and Yiddish. 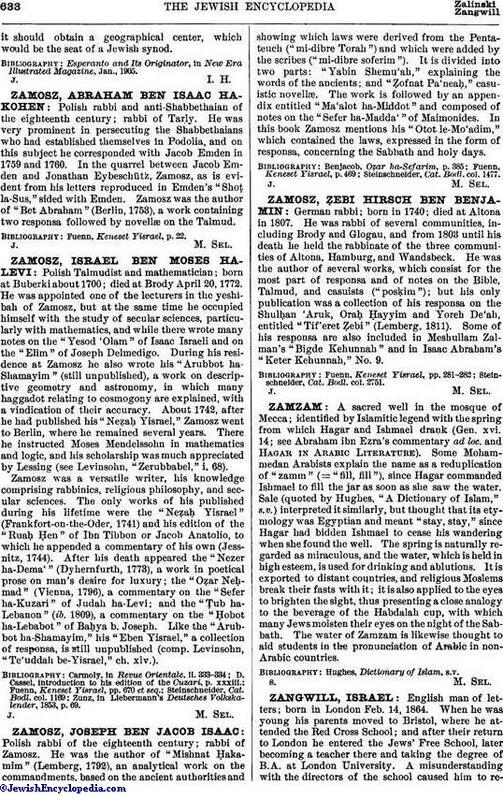 This work was followed by "The King of Schnorrers" (London, 1894), which also was translated into Yiddish, and by "The Dreamers of the Ghetto" (1898); the former work applying to the London ghetto life of the eighteenth century the bizarreries of the "new humor," the latter work dealing with a series of historic scenes ranging from the times of Shabbethai Ẓebi and Spinoza to those of Lassalle and Disraeli. In "The Dreamers of the Ghetto" Zangwill is not altogether successful in reproducing the past, but he shows a keen insight into the characters of such men as Solomon Maimon, Heine, and Beaconsfield. In general literature also Zangwill has achieved considerable success. His novels "The Master" (1895), dealing with art life, and "The Mantle of Elijah" (1901), treating of imperialism and the political problems connected therewith, have been widely read; and various shorter sketches, published by him in volumes entitled "They That Walk in Darkness" (1899) and "Gray Wig" (1903), show remarkable versatility and brilliance. He contributed to "The Pall Mall Gazette" a series of critical causeries, part of which were republished under the title "Without Prejudice" (London, 1896); and these perhaps show Zangwill's powers in their most characteristic form. He has also published many poems and verses, including some striking translations from the medieval Jewish poets that are now being included in the authorized festival prayers of the English Jewish congregations. Most of these poems have been collected under the title "Blind Children" (London, 1903). Zangwill has written several dramatic sketches which have been produced with more or less success, among them curtain-raisers like "Six Persons," "Three Penny Bits," "The Revolting Daughter," and "The Moment of Death," a striking and original melodramatic study produced at Wallack's Theater, New York, 1901. In addition he dramatized his "Children of the Ghetto," which was produced with success in the United States, where it ran for nearly a year. It was likewise produced at the Adelphi in London (1899); but the Boer war diverted public attention, and the play was withdrawn. Zangwill's dramatization of his Christmas story "Merely Mary Ann," written in 1893, was very well received both in England and in America (1904-5), and was followed by "Jinny the Carrier," in the United States (1905). 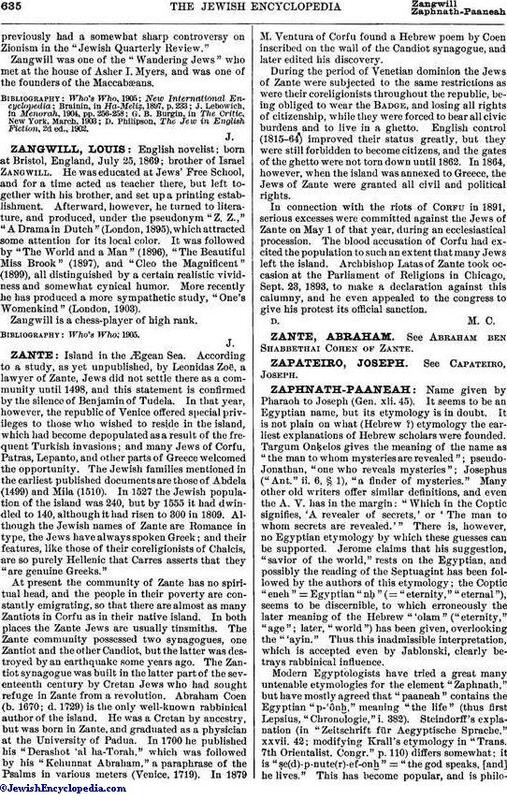 Zangwill has been a successful lecturer, traveling in that capacity in the United States (1898), through Great Britain, Ireland, and Holland, and to Jerusalem, which he visited in 1897. He has taken great interest in Zionism, and has attended most of the congresses at Basel, at first merely as a critic and onlooker, but later being drawn into the movement, of which he has become one of the leading spirits. He has written and lectured much on the subject, advocating in the United States (1904) and elsewhere the acceptance of the British government's offer of an autonomous settlement in British East Africa. On the refusal of the Seventh Zionist Congress to consider any further offer of the kind, Zangwill formed a separate body, the Jewish Territorial Organization, intended to obtain, preferentially from the British government, an adequate tract of country in which persecuted Jews can live their own life under Jewish conditions. Among those whom he has attracted to his views is Lucien Wolf, with whom he hadpreviously had a somewhat sharp controversy on Zionism in the "Jewish Quarterly Review." Zangwill was one of the "Wandering Jews" who met at the house of Asher I. Myers, and was one of the founders of the Maccabæans. D. Philipson, The Jew in English Fiction, 2d ed., 1902.